Whether or not you’ve been with your company for a long time, we all hit a point where we’re trying to figure out our next steps. This could be asking for a promotion, changing departments, or leaving the company altogether for something new. When we land on looking outside the organization, there are a few financial things to think over before we hand in our resignation. If we decide to prematurely leave, we may lose or owe our company’s thousands of dollars. And who wants that? 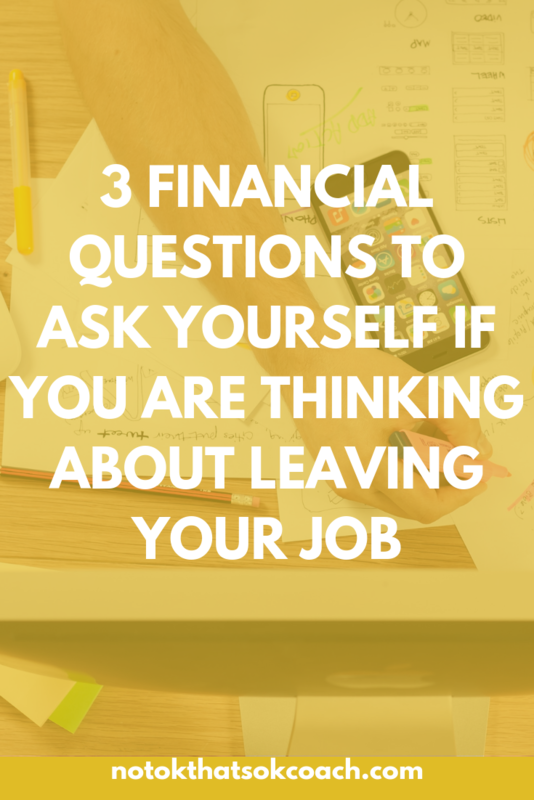 Let’s go over three financial questions to ask yourself when you’re thinking about leaving your job. Am I 100% vested in my 401K? Will I have to pay any benefits back to the company? Vested means the level of ownership you have in a 401K. In order to be fully vested, many companies require that you work for them for a certain length of time. If you leave before then, you can only keep a portion of what the company contributed. For example, if you make $50,000 a year and you contributed 10% of your salary to your 401k and your company matched your contribution up to 6% for the two years you worked there. Your contribution would be $10,000 and your company’s would be an additional $6,000. If your company required you to stay with the organization for three years to be fully vested, you could potentially lose all or a portion of their $6,000 contribution (depending on the vesting schedule) by not staying for that length of time. Similarly, when you receive a sign-on bonus or the company pays for your education, you may be required to stay with them for a designated time period. If you leave before then, you have to pay it back. This could be thousands of dollars that you now owe your company. If they are also about to give out bonuses for all the hard work you put in over the last year, think about the timing of your departure. Take a look at your benefits and reach out to human resources if you have specific questions about policies. You don’t want to leave too soon if you’re close to being fully vested, will miss out on a bonus or owe your company money for a degree or classes they paid for. Have I budgeted for health insurance benefits? Many companies don’t allow you to start with their health insurance benefits until 30 days (maximum of 90 days) after hire. If your first day is the day right after you leave the current job, you still might be waiting a full month for your benefits to kick in. And if you don’t start your new job right away, you have the potential to have an even longer lapse in coverage. If you’re planning to leave your current job, it would be worth considering an exit date at the beginning of a month. You’re typically covered for the entire month and if you start your new job right away, you’ll be more likely to not have a lapse in coverage. But before you hand in your notice, make yourself aware of the health insurance policies for your current employer and the wait time for your new employer. This information can usually be found in your new employee documents, on their website, or by calling your current health insurance company. Lexington Law also shares health insurance alternatives. These are some other options you can take if you’re unsure what to do in between coverage. If I don’t have a job lined up, do I have enough savings? While I usually advise people to have a job lined up before they leave their current situation, it may not always be a possibility. This might be because you’re moving, making a life change, or another personal situation. In those cases, you really need to think about your financial security. We all need food and a place to sleep and unfortunately without money, those things are hard to come by. If you don’t already have a budget, now is the time to start. It’s important to see where your money is going and to be more conscious of these expenses. Determine what expenses are non-negotiable (food, housing) and what expenses may need to be reconsidered. Even though you may be financially OK for one month, recognize that it may take more time to land your next job. Between the time to apply, interview, and accept a new job offer, it could be several months. In the meantime, you may want to consider doing something part time or picking up more hours with your side hustle. Going from a steady paycheck to none at all will be very difficult and you don’t want to fall into a trap when you’re putting everything on credit cards. This will lead to huge debt! Although you may want to pack your bags and head out the door of your current employer, it’s important to take a step back before doing so. You don’t want to leave and miss out on money for retirement, and worse yet owe your company money. If you’re in a situation where you have to leave, make sure you have a financial plan. While preparing to leave your job you may also want to make sure your credit is in good shape. The professionals at Lexington Law are here to help and can provide you with personalized assistance so you can repair your credit. Their blog is also a great resource.